Dennis Covington crosses lines you're not supposed to cross. It's his charm, his power in nonfiction. It's how close he gets, how radically vulnerable he becomes to his subject. As a writer, he seems driven by something more desperate than a desire to simply bear witness. This was the key to his now-classic Salvation on Sand Mountain: Snake Handling and Redemption in Southern Appalachia, written twenty years ago. As a newspaper reporter, he was covering the story of a snake-handling preacher on trial for murder after a rattler bit and killed the man's wife. But soon Covington, attending services at The Church of Jesus with Signs Following, got bitten by the Holy Ghost, joined the church, nearly forgot about writing a book, and took up serpents himself. The book he eventually wrote pulls us in with him, across the line between outsider and insider. Together we undergo the shouting, frenzied summoning of direct mystical experience amidst things we fear and a people we discover might truly be our own. 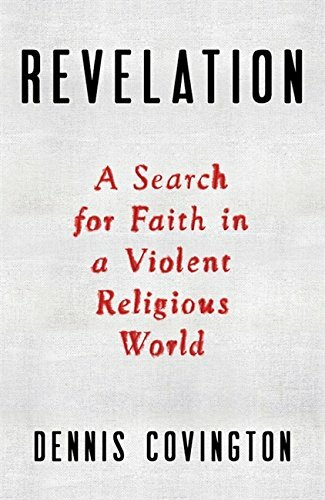 To read Covington's newest book, Revelation: A Search for Faith in a Violent Religious World, is to feel that undertow once again. But this time, it pulls him, and us, into darker places than rooms full of reptiles and Pentecostals. When I first met Dennis Covington, more than four years ago, I didn't know he was just weeks away from setting out on the fraught quest that would become this book. He was the visiting author at our small writer's residency on the windy shores of the Pacific Northwest, and on the first night he turned our small lecture room into a snake-handling church service. It was more of a performance than a reading, straight out of Sand Mountain. Somehow he harnessed the energy, the music, the shouting call and response in Alabama drawl, all the yearning and wild certainty. He transported us. This aging man, lanky and underdressed, with bright blue eyes, he sang. It lifted the room into another register.